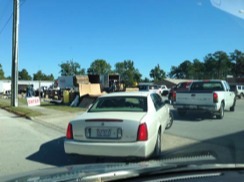 Once a year the Coastal Environmental Partnership sponsors a series of Household Hazardous Waste and Electronics Collection Days in Carteret, Craven and Pamlico counties. We accept: latex and oil paints, used motor oil, lawn and garden fertilizer and pesticides, gasoline, drain openers, paint thinners, cooking oil, anti-freeze and batteries. For information on Electronics recycling, contact your local Solid Waste Department for year-round disposal options for these items. 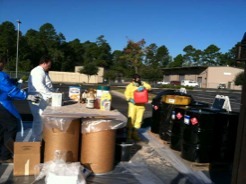 Businesses can visit www.p2pays.org/DMRM/start.aspx for an extensive list of hazardous waste management companies. Paint cannot be landfilled because it is a liquid. Dried paint in cans can be dumped with your regular trash. So can empty paint cans. If you have paint that is not dry, leave the lid off for a while and let it dry out, or speed up the process by adding kitty litter or Oil-Dry to soak up the liquid. 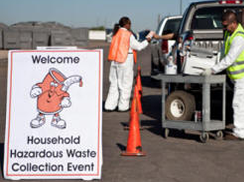 Once it is not longer a liquid, we will be glad to take it along with your regular household waste. In Craven County, paint is accepted for recycling at the County Convenience Centers. Contact Craven County Solid Waste at (252) 636-6659 for more information.